Earvin “Magic” Johnson has gone from basketball royalty to business mogul. He’s won five national championships with the Los Angeles Lakers, 3 MVP awards, 12 NBA All-Star games and an Olympic gold medal at the 1992 Olympics in Barcelona. Johnson has successfully parlayed his skills and tenacity on the court into the business world. He now runs a multi- million dollar empire, Magic Johnson Enterprises (MJE), which includes movie theaters, a multi-cultural media company; restaurants, athletic clubs, shopping malls and more. In 1994, he began his first year as the Los Angeles Lakers’ vice president and 2012, Johnson joined a partnership that purchased the Los Angeles Dodgers baseball team. He has teamed up to build a new stadium and bring an NFL team back to Los Angeles. 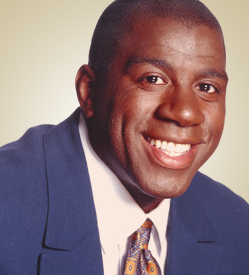 He is chairman and founder of the Magic Johnson Foundation, which promotes HIV/AIDS awareness and prevention programs and is committed to improving the quality of life for people residing in urban communities. The story of Johnson and Larry Bird’s inspiring friendship and rivalry, “Magic & Bird” was presented on Broadway in 2012.